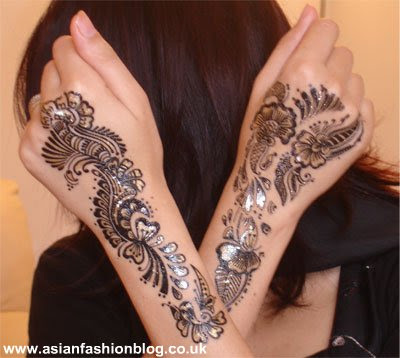 Doesn't henna/mehndi look fab? It can do, if you get a good henna artist to apply it for you, and if you leave it on long enough...I don't know about you, but I'm a busy girl and I don't always have time to sit around waiting for it to dry, and picking a good henna artist can be a bit hit and miss! Well, if you've got an occasion, and you're in a rush here's a quick fix for you: henna tattoo transfers. You know the type I mean, like these, you peel off the back, put it on your skin, apply water and then the design tranfers onto your skin. Oooh those are beautiful! Thanks for the tip!